Yay! I'm so glad it's the weekend even though I have to work today. My parents will be leaving for their cruise this week so it's my last chance to really hang out with them before they go. Not sure what we'll do, maybe I'll take them to the Getty so they can see some gorgeous views of the city. What plans do you have? I can't believe it took me this long to try Zoya Lotus! It's a gorgeous dusty purple shade with pink shimmer that glistens even in low light. I had no trouble with the formula or application, as is expected with most Zoya polishes. This one is definitely a keeper for me! Two coats shown here with no topcoat! I've been intrigued by Pahlish's Slow Fade Of Love ever since I saw swatches start popping up online. 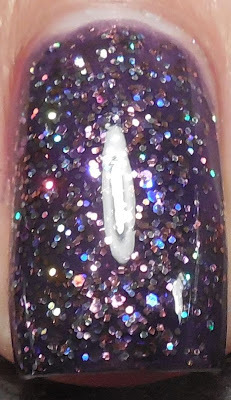 The holographic purple microglitter seemed out of Pahlish's normal realm of glitters in that it didn't have any larger hex glitters or any contrasting colored glitter. It does come in a sheer grape jelly base and is hard to distinguish whether it's just one or two shades of microglitter, but in any case, once it's on the nails it really sparkles like crazy. My camera had difficulty catching all that glitz and shine, so just imagine it ten times more sparkly than what you see here. I used two coats with a layer of Gelous because it was a bit topcoat hungry, and finished with a layer of Poshe to hasten drying. I love how unique this in regards to the rest of Pahlish's collection and I can understand why this beauty has remained a core polish. The purple glitter is just simply stunning and I could watch my nails all day while wearing it. What is your favorite Pahlish color?